In a world where even, the world map (when converted into musical notes) makes up a tune, creating iOS applications has to be specific and systematized. The flexibility and pervasiveness of all Apple devices allows designers to blow life into their vivid thoughts and showcase them for a huge base of customers. Within a development landscape so happening, innovative engineers are attempting all kinds of applications and business ideas-all out of the box. Thus, it becomes imperative to span through an iOS app development checklist from iOS development space. Due to the fiercer competition on the App Store and the underlying captivation by the gadgets, lucrative iOS advancements from enormous organizations have been a common sight in the recent past. This has certainly rolled out promising opportunities for engineers with iOS development skills. It accompanies its own advantages – an enduring paycheck and a profile rocketing exposure. So, it is an important step for any iOS enthusiast to follow an iOS developer roadmap. It is an undebatable fact that iOS development is a vast field for anyone to first explore and then pick his sweet spots to conquer. Since an iPhone multi-tech utility and a lot goes within, it is often difficult to know which of those to sharpen first. Would it be a good idea for me to learn Core Audio before Core Data? There would be so many such questions that bounce up in your mind every now and then. On the off chance. No tiny mortal can handle everything, so where to confine your focus beamingly? 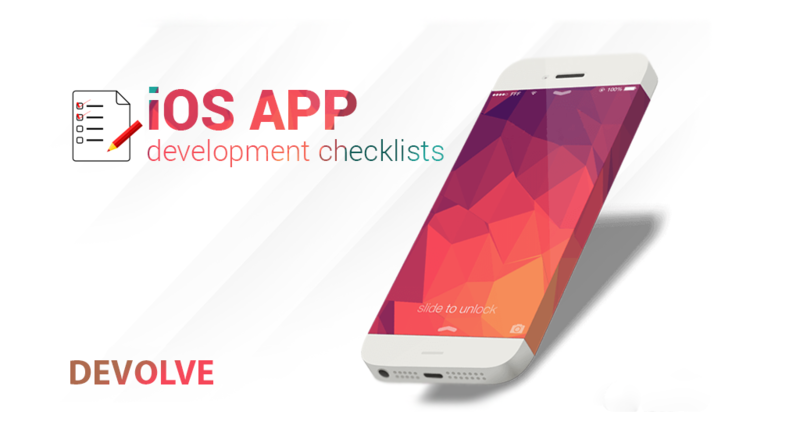 Devolve brings you a simple iOS app development checklist. How to strengthen it further? These themes and development systems won’t be appropriate for each task, however probably, a couple will. Understanding their purpose and where they live in the iOS scene through a hands-on involvement will raise the possibility of your success exponentially. It is important to have sharp debugging skills that can set you in the best position to be able to do away with bugs. In fact, no designer can; particularly not a relative freshman. A good debugger is generally attributed with above average basic reasoning abilities to work through issues and is cognizant of his breaking points. You will possibly be an overseer of an extremely costly codebase or brand and they should have the capacity to assume that you will treat it with care and alert. With the interest in this trending skill comes a fancy paycheck. As indicated by Indeed, the normal payout for iOS experts is 68% higher than the normal pay for other employment postings. To be sure of reports, they state that an iOS expert draws around $98,000 per annum. You can expect yourself to be paid on the similar lines with the iOS app development checklist all ticked. This isn’t a short stretch as the pay scale further motivates you to hit the iOS developer roadmap persistently. Also, Mondo, an organization that enlisted people and places innovation specialists, reports that iOS Developers’ pay ranges from 105,000 to 155,000 USD per annum. There is a great deal of interest for iOS Developers today which makes us bring you the right iOS app development checklist. It’s a reality that the best trending skillset requires a finer aptitude with a specific end goal. It takes things beyond basics, to figure out where one can contribute as a developer or a designer. What’s more, putting your opportunity and assets in learning iOS advancement is the best advance forward for a lucrative vocation.